How To Hold A Pool Cue Stick? A lot of talented, professional pool players would have no typical answer or proper guide when asked about the correct way to hold a pool cue stick. This is mainly because to hold a pool cue stick essentially comes to them naturally, and they’d find it hard to actually “explain” the process to someone else. Not every pool player is that talented though, and that’s why beginner/amateur players always try to ﻿﻿l﻿﻿ook for a “blueprint” to follow just to get things up and running. With time and experience, players tend to “adjust” their grips to what they feel is most comfortable for them. This is why, you can always start with a guide to a “basic” grip, but bear in mind that you should be flexible in the future and should not consider this to be the “one and only” grip. There’s no “right” or “wrong” way to hold the stick, there are only basics to put you on the right track and make your learning curve less steep. 4 Time To Go Out There! 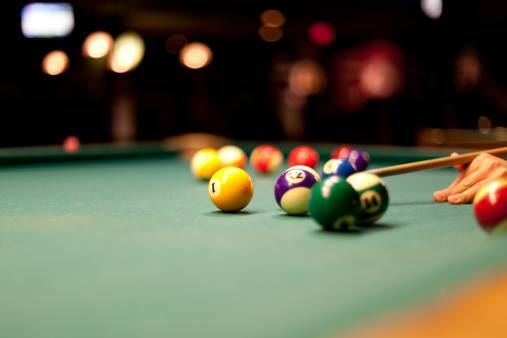 Knowing how to make a “solid bridge” is key to any good pool game. That’s just another way of saying “how to hold your cue”. Both of your hands are obviously involved in the process. First is your back-hand, and that’s your dominant hand (the hand you write and eat with! ), this hand controls the power, speed and timing of your shot. It’s the “muscle”. The front-hand, on the other hand (no pun intended! ), “guides” the cue and helps you maintain balance when you bend over to take the shot. While we can’t quite call it the “brains”, it’s pretty close. Let’s take a look at the positioning of both hands. Let’s start with the backhand. If I am to describe the grip to you in two words, I’d say: loose but controlled. Think of holding a baby. You’re being as gentle as possible while maintaining control. To achieve that, try using two or three fingers to grip the cue from the outside while using your thumb on the inside to support your grip and prevent the cue from falling out of your hand﻿. This not only helps you to stay in control of the cue while not having to hold it very tightly, but also allows your cue to move through the stroke in one fluid motion, making it less likely to jerk and mess up the intended trajectory of the ball. Now that you know how to generally hold the cue with your backhand, let’s look into how you can modify your grip to reach what suits you best. To figure that out, we’ll use the 90-degree rule. Here’s how that works: Get into position to hit the cue ball then place your front hand about 7 inches from the cue ball. We haven’t gotten into how to hold the cue stick with this hand yet, so don’t worry about that now. You can simply place your hand on the table with the cue stick above it. Just make sure the distance from the cue ball is as outlined. Now move the cue forward till it touches the white ball, then take a look at how your back arm is positioned. What you want to do is create a 90-degree angle between your back forearm and your cue. Slide your back forward or backward until you achieve that. When you finally nail it, congratulations, you’re now gripping the cue correctly. Creating a “bridge” with this hand serves as the “guide” as I outlined earlier. There are two popular types of “bridges”. The “closed bridge” and the “open bridge” (which is also known as the V bridge). Both bridges have their advantages. For example, the closed bridge typically offers more control, is very stable and prevents the cue from lifting up during stroking. The open bridge is easy to make and allows you to see down the cue easier, helping you achieve better aim. To make an open bridge: Put your hand flat on the table and raise your knuckles off while keeping your finger tips and the heel of your hand firmly pressed down. Now move your thumb up against the side of the rest of your hand and place the cue in the v shape formed between your thumb and hand. Et Voila! You’ve got yourself an open bridge by the book. To make a closed bridge: Put your hand on the table and make a fist, then spread the three fingers that are furthest from your thumb, and leave the one right next to your thumb as is. Now lift that finger and have your thumb slide underneath it. You should have a loop created between those two fingers, now all you have to do is slide the cue’s shaft inside that loop and you’re done! Time To Go Out There! And there you have it! A simple guide to holding a pool cue stick. Now, you have to remember two things. First, you’ll find yourself often thinking about the grip and taking time adjusting them before each shot. Don’t worry about that because with practice, you’ll find yourself making the correct grip naturally. Think like when you first started driving and had to think about where your leg is at and where your hand is at, then it became second nature to you. Same here! The second point you should remember is that it’s totally okay to adjust or tweak those grips to your liking as long as you’re not completely diverting from the basics. Now that you’re armed with this knowledge, go out there and start practicing, because what you’ve just read is useless if you don’t put it to practice, lots of practice!